Jungheinrich EJEi25-EJCi15-EJCi15z stainless steel pallet trucks are designed for hardest applications in corrosive and humid environments as well as satisfying the most stringent hygienic requirements. Two separate motors assure powerful drive and excellent handling, even on difficult surfaces. High quality stainless steel and fully enclosed electronics to protect against jet washing allows easy cleaning and disinfection. Added to this are high-technology seals with moving components offering extra protection. This more than satisfies the high demands made in the food, pharmaceutical and chemical industries. 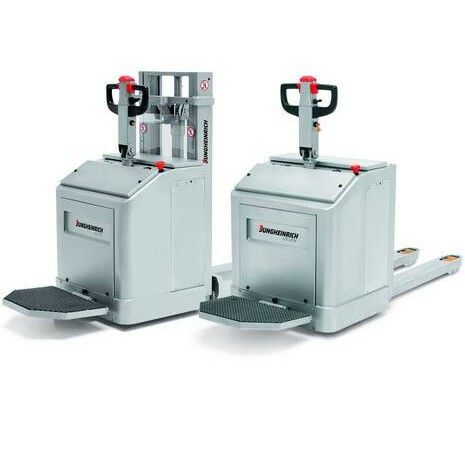 The stand-on platform (optional) transforms the truck easily from a pedestrian operated into a ride-on truck and thus increases operating comfort, especially during transport over longer distances. High-quality V2A stainless steel also offers an abrasion-resistant and smooth surface, even with intensive use: This prevents dirt deposits, thus preventing the spread of germs and bacteria.